There’s one red which looks as brilliant today as when it was first brushed out five hundred or even two thousand years ago. It’s a pigment which was known to, and used by, the Romans, and in ancient China was not only extensively used in art, but used to be scattered in graves. Vermilion is one of the most toxic pigments, and over the last century has been displaced by Cadmium Red and more recent organic pigments. Look at many paintings made before 1870, and their reds are likely to be dominated by Vermilion. For a long time, Vermilion paint was made using powdered Cinnabar, naturally-occurring mercuric sulphide, and is then technically referred to as Cinnabar rather than Vermilion. Its manufacture from liquid mercury was probably brought from China to Europe, since when much of the Vermilion pigment used in Europe has been synthetic. In Europe, the main source of Cinnabar, and of the metal mercury, were the mines at Almadén in Spain. These were used by the Romans, and until their closure in 2000 had produced more Cinnabar and mercury than any other location. In 1563, deposits were discovered in Huancavelica in Peru, and they were the second largest source over the following three hundred years. Other important sources have been located in China, Slovenia, Italy, Mexico, and the USA. The mining of Cinnabar has long been recognised as hazardous, due to its great toxicity – something known as far back as the Romans. Locked in pigment particles in oil paint it is less hazardous than in water-based paints such as egg tempera; it is wisest not to use Cinnabar or Vermilion in dry form, such as in pastels, even with good respiratory and skin protection. Even with careful handling, pigment residues pose a serious threat to the environment. 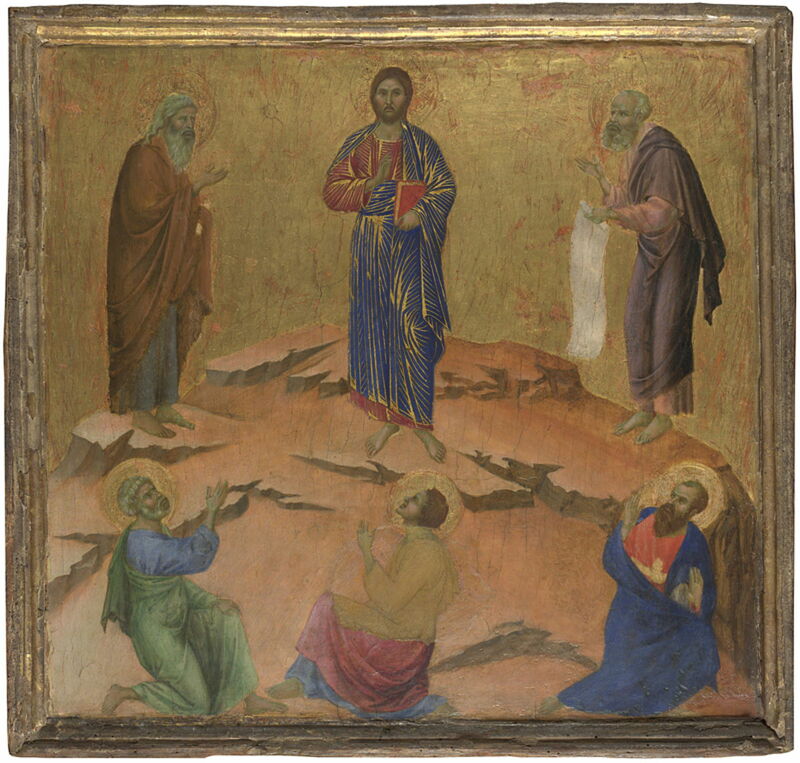 Duccio (fl 1278, d 1319), The Transfiguration, from the Maestà Predella Panels (1307-11), egg tempera on wood, 48.5 x 51.4 cm, The National Gallery (Presented by R.H. Wilson, 1891), London. Courtesy of and © The National Gallery, London. The brightest of the reds in Duccio’s Transfiguration, from the Maestà Predella Panels painted in 1307-11, have the distinctive colour of Vermilion. It is often associated with holy people, and holy objects, and contrasts with the other brilliant pigment of Ultramarine, which is conventionally used in the clothing of the Virgin Mary. 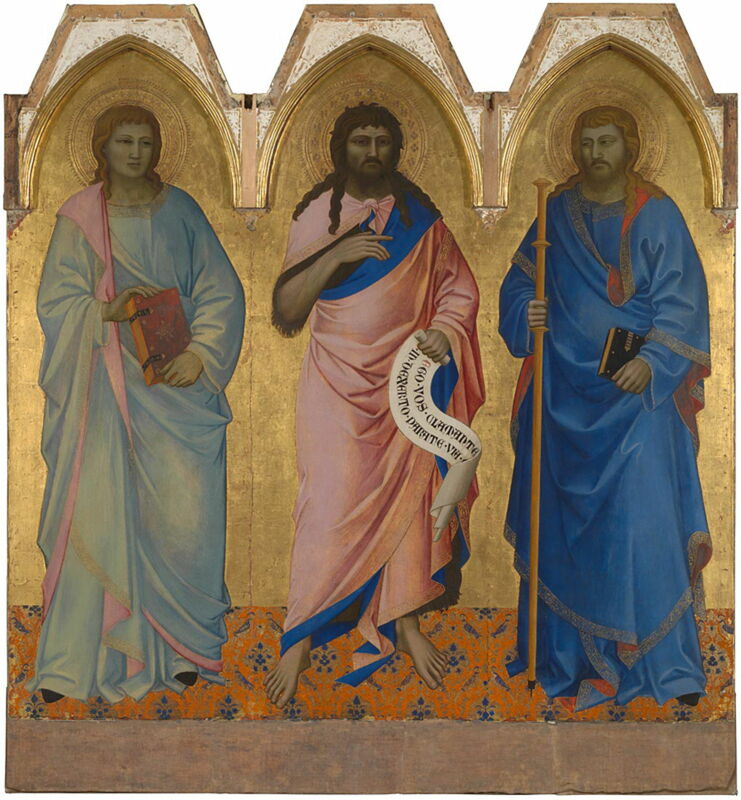 Nardo di Cione (fl 1343, d 1365/6), Saint John the Baptist, Saint John the Evangelist and Saint James (1363-5), egg tempera on poplar, 159.5 x 148 cm, The National Gallery (Bought, 1857), London. Courtesy of and © The National Gallery, London. Its one unfortunate habit is a tendency to blacken, by forming the black version of Cinnabar known as metacinnabar. This tends to happen more often in the thinner, less protective paint films of aqueous media, particularly egg tempera, as shown in Nardo di Cione’s Saint John the Baptist, Saint John the Evangelist and Saint James from 1363-65. The lining of the clothing of the saint at the right is painted using Vermilion, and has darkened in patches as a result of this effect. Masaccio’s panel of Saints Jerome and John the Baptist from the Santa Maria Maggiore Altarpiece, from 1428-29, is another fine example of the use of a lot of Vermilion (as Cinnabar). The robes of Saint Jerome, on the left, may also show a little darkening in patches, but contrast well with the paler and pinker red of Saint John the Baptist at the right. 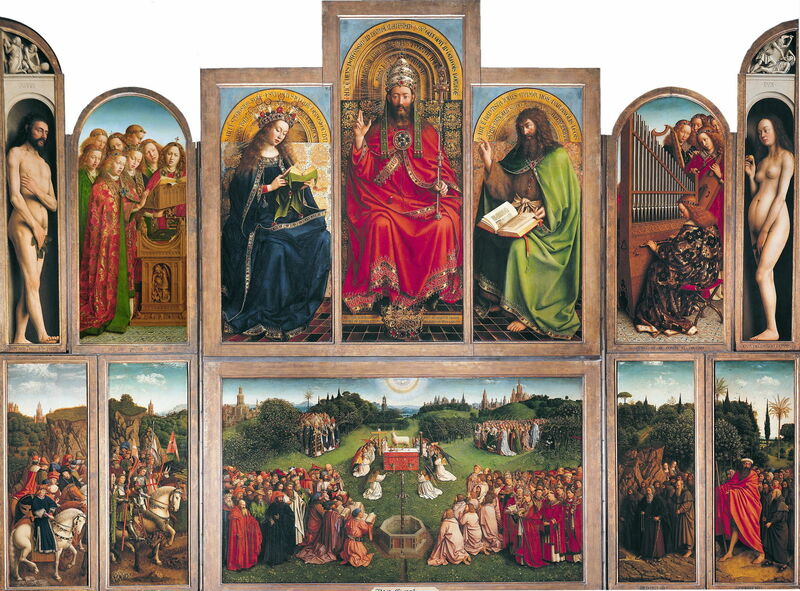 Cinnabar saw extensive and highly effective use by the van Eycks in The Ghent Altarpiece (c 1432). Because this was painted in oils, the chances of discoloration are much lower. 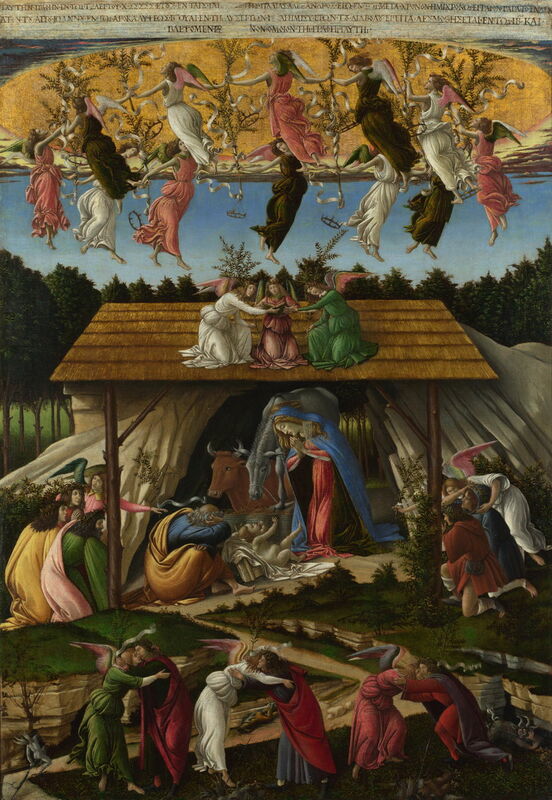 Botticelli used Cinnabar in several passages in his Mystic Nativity (1500), where its persistent colour contrasts with his use of other red pigments, which have not retained their colour as well. All the Masters and most other significant artists of the past used Cinnabar, or Vermilion when it was being manufactured in Europe by the early seventeenth century. 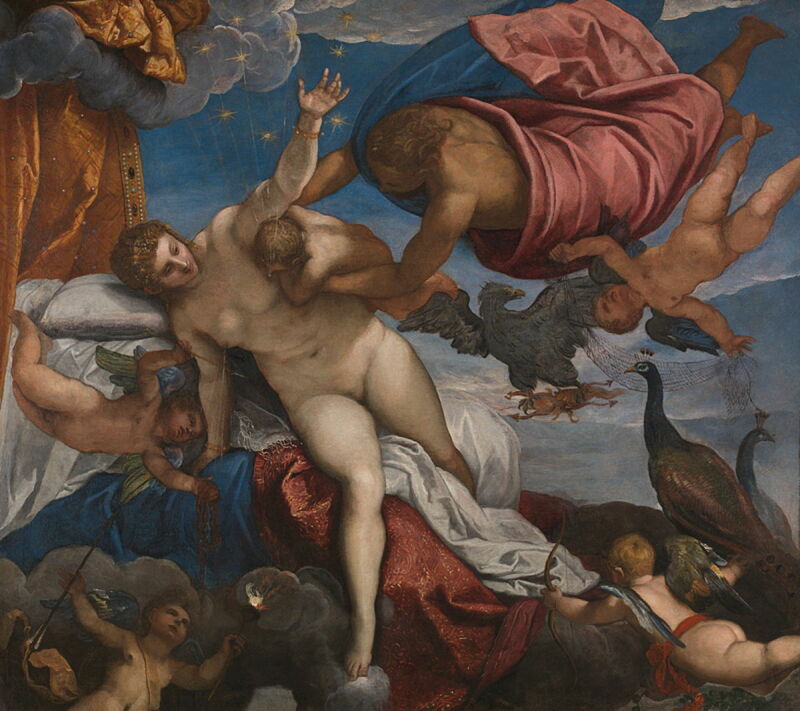 Tintoretto, whose five hundredth anniversary we will be celebrating later this year, was no exception, as shown in these two examples: Jupiter and Semele (1545) above, and The Origin of the Milky Way (c 1575), below. 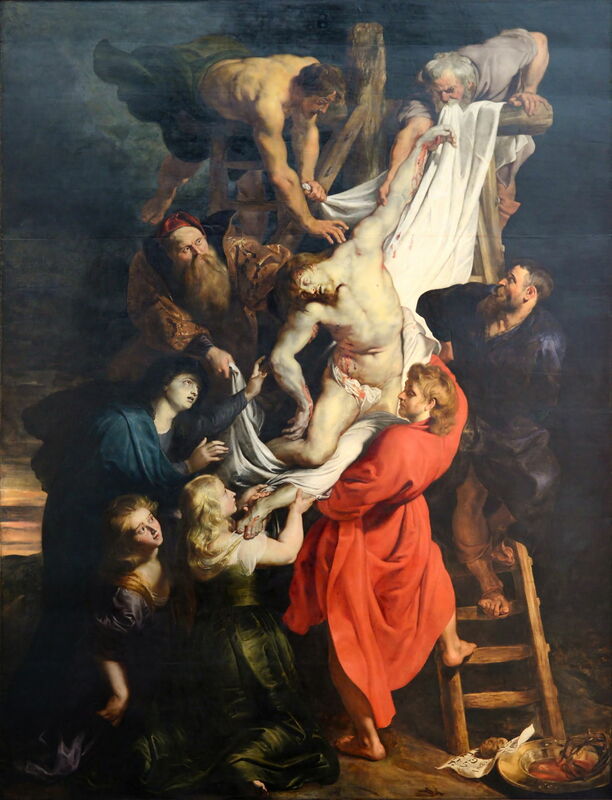 Peter Paul Rubens’ centre panel of the Descent from the Cross (1612-14) in the huge triptych in Onze-Lieve-Vrouwekathedraal, in Antwerp, is one of the most spectacular demonstrations of the use of Vermilion, and its lasting chromatic brilliance. 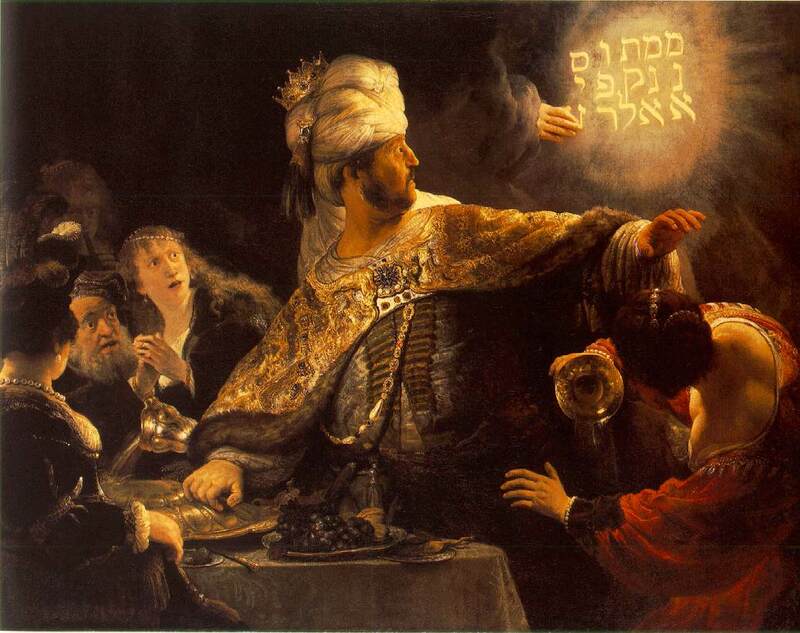 Rembrandt is another Master who used Vermilion to great effect, here in the dress of the woman at the right, in his Belshazzar’s Feast (c 1635-38). The colour draws attention to her as she is so shocked as to empty the goblet she is holding in her right hand. A duller colour might have allowed this dramatic action to pass unnoticed by the viewer. Aelbert Cuyp (1620-1691), A Hilly River Landscape with a Horseman talking to a Shepherdess (c 1655-60), oil on canvas, 135 x 201.5 cm, The National Gallery (Bought, 1824), London. Courtesy of and © The National Gallery, London. 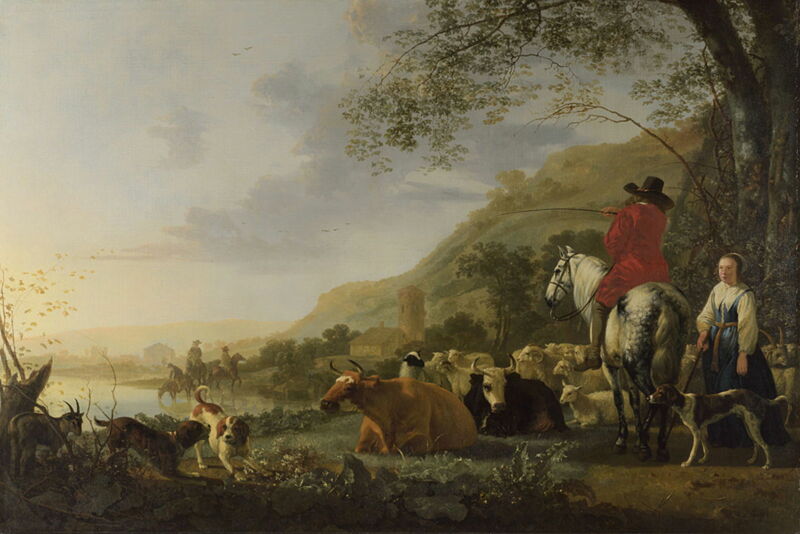 Aelbert Cuyp’s Hilly River Landscape with a Horseman talking to a Shepherdess from about 1655-60 is one of the few oil paintings in which darkening of Cinnabar has become obvious. The pigment serves well in the huntsman’s coat, but has become darkened in patches. 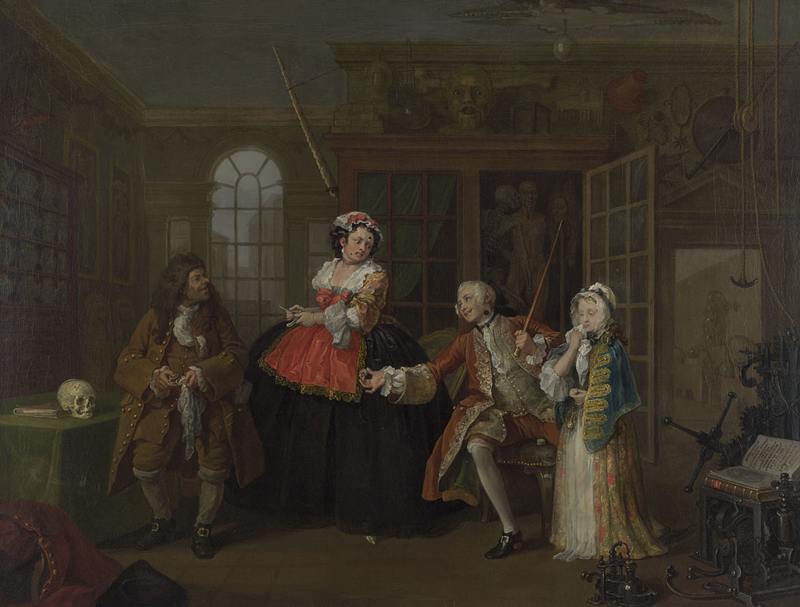 William Hogarth played on another common association of the colour red in the third painting, The Inspection, from his series Marriage A-la-Mode (c 1743). Although in English we usually refer to a scarlet woman, rather than a Vermilion one, his use of Vermilion here is effective in portraying the woman as a prostitute. Vermilion remained popular well into the latter half of the nineteenth century – long enough for it to grace the paintings of the Pre-Raphaelite movement and the French Impressionists. 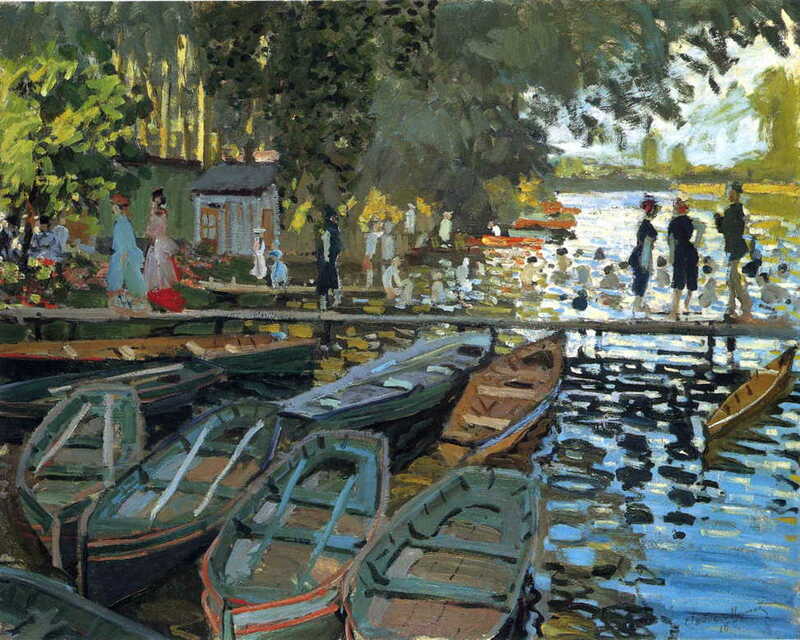 Although Claude Monet used just a few dabs and strokes of Vermilion in his landmark painting Bathers at la Grenouillère (1869), he continued to use it well into the latter years of his career. By that time, though, the new Cadmium Reds were replacing Vermilion, a process which is almost complete today, and seeing Cadmiums themselves being replaced by modern organic pigments. But for me, with its long history of use in the clothes of saints, it remains the red of heaven. RJ Gettens, RL Feller & WT Chase (1993) Artists’ Pigments, vol 2, ed Ashok Roy, Archetype. ISBN 978 1 904982 75 3. Posted in General, Life, Painting, Technology and tagged artists paints, Botticelli, Cuyp, di Cione, Duccio, history of painting, Hogarth, Masaccio, Monet, painting, pigments, Rembrandt, Rubens, Tintoretto, van Eyck. Bookmark the permalink. Cadmium red is fairly toxic, as well…airborn. Yes, but I think the mercury in Vermilion dust is more readily absorbed and thus more likely to prove toxic to the body. I wouldn’t like to risk either, though. It’s a shame that so many wonderful colours are so toxic, not just to us, but to the environment as well.